Note: This is a reprint of my review for Brooklyn, which originally ran on September 11, 2015 after seeing it at the Toronto Film Festival. I am publishing it again today as it hits theaters this weekend. Brooklyn is gorgeous and moving and all things warm and fuzzy without ever devolving into a Hallmark channel original. From the moment the film opens on a doe-eyed and innocent Saoirse Ronan working feverishly in a convenience shop in the early 1950's I was hooked by the effortless quality of the inviting atmosphere director John Crowley (Boy A, Closed Circuit) establishes. Even when a character as horrible as Ronan's prickly boss is present she can't dampen the mood of the eternally vibrant tone that radiates off this thing like a campfire in early fall. This immediate sense of safe familiarity allows for the rather objective-less story adapted from Colm Toibin's novel by Nick Hornby (About A Boy) to feel all the more profound and affecting as it unravels. While nothing that happens in Brooklyn will make you think too critically or give you a sense of accomplishment it is more a relaxing and comforting experience of a movie. It exists simply to make you feel something. Whether that something is overly sentimental or not will depend on your own mentality, but for the sake of my gullible and rather naive mind it was a perfectly cooked and plated dessert that made me feel cozy to the point of almost feeling gluttonous. 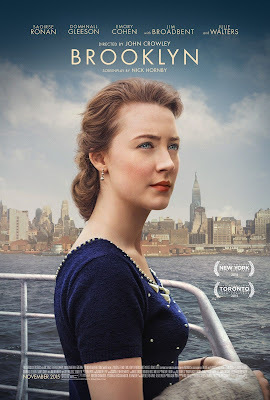 Brooklyn gives and gives and never fails to keep you in line with it's simple narrative and somewhat complex emotional roller coaster that is complimented by it's ability to paint it's scenarios as simply as it can. Cheers to simplicity, to pleasantries and to being sappy; sometimes, it's all you need. 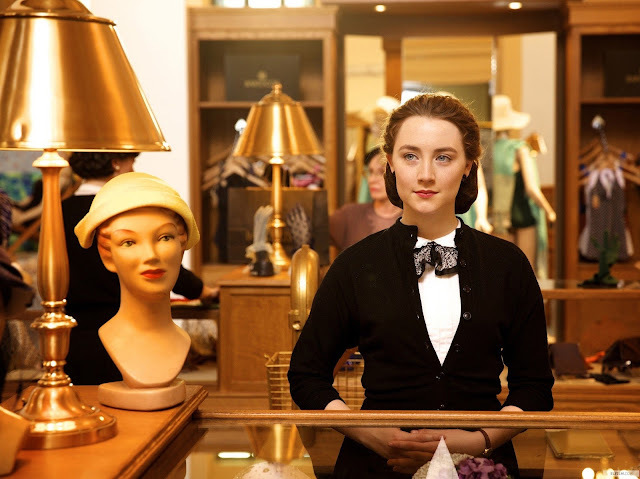 Eilis (Saoirse Ronan) finds it hard to adapt to her new role in America. The year is 1952 and Eilis Lacey (Ronan) is a young Irish immigrant navigating her way through her new life in Brooklyn. After her beloved older sister, Rose (Fionna Glascott), writes a letter to a friend and priest (Jim Broadbent), she is able to secure a boarding house and a job for Eilis to take once she arrives. This is all for the sake of the promise America holds almost guaranteeing a better life for the young and ambitious. There is no opportunity for a promising girl like Eilis in Ireland and so she departs the comfort of her mother’s (Jane Brennan) home for the unknown shores of New York City. While the innocent and naive Eilis is initially ravaged by homesickness she comes to acclimate herself well to her surroundings, in her new job and by taking night classes at a local college that she breezes through. Soon after arriving Eilis also meets Tony (Emory Cohen of The Place Beyond the Pines) and her homsickness begins to diminish as this fresh romance with the attractive and charming Italian sweeps her off her feet. Naturally, all cannot continue to get better from here or we would have no movie, but as sure as the sun sets Eilis' happiness is quickly interrupted by her past, forcing her to return to her homeland. Upon returning Eilis is heavily coaxed by her mother and best friend, Nancy (Eileen O'Higgins), to fall into a relationship with the available and sought after Jim Farrell (Domhnall Gleeson). Given she now has a certificate from a college in bookkeeping Eilis is also able to secure a good job in her small hometown, but while she is charmed by the thought of returning to the life she always thought she wanted she knows she will have to choose between two countries and the potential lives that exist within each. It is easy to spot. The idea or message of the movie, that is. Home is where you make it, where your heart is or whatever other glib saying one could come up with to quickly summarize such sentiments. Why then, is a movie that aspires to profess little more than this greeting card saying so charming and rapturous? Well, that would be because everything about the film seems to have been dealt with in such genuine care and emotion. The attention to detail is evident whether it be in the intentionally warm lighting that gives off the comfort level of being tucked under ten layers of covers on a snowy day no matter if a scene takes place at the fancy department store where Eilis works or outside on a snowy winter night; the small touches of hilarity that are the exchanges between the head of the boarding house, Mrs. Kehoe (Julie Walters), and her string of girls that stay with her or even the period costumes that emit such color and diversity you could easily pick up on any one characters mood even if they weren't conveying it themselves. Beyond being well cared for, director Crowley conveys the natural emotion that comes from the story in such convincing and effective ways that it is almost impossible to not become caught up in the tragedy and dilemmas that face our protagonist. In a sense, this is a perfectly composed film in that it hits it's major first, second and third act points in natural succession and moves along briskly while consistently ramping up the audiences interest level into how such drama will come to a resolution. The film is completely traditional and offers nothing new in the way of directorial prowess or interesting ideas to the point it can only fly so high, but it is done with such professionalism and confidence that it flies as high as it possibly can. Eilis is swept off her feet by a young Italian boy named Tony (Emory Cohen). Living in our fast-paced, digital world where we're able to connect with the touch of a button it is easy to forget how life-changing and potentially traumatizing traveling to another country once was. There was no turning back, there was no guarantee of ever seeing your loved ones again and communication was stilted by the inability to deliver letters only as fast as any ship could carry them. Brooklyn focuses in on these moments, these small instances where what is happening is understood and the potential consequences are understood and they are simply heartbreaking. Specific shots in which Rose stands on the dock as long as she possibly can watching her sister sail away or Mrs. Lacey hug her daughter for what she knows will likely be the last time gut you like you can't imagine and only serve to reinforce the strength of the storytelling and why such a commonplace tale can be so moving. While the film is filled with glorious performances it is Ronan that clearly and somewhat obviously stands above the rest. Her arc as Eilis is truly one of a palpable transformation and gives the film the necessary weight for it to feel profound in the unexpected way that it is. We watch this young woman grow up before our eyes, witnessing her come face to face with harsh realizations and new experiences that test her spirit. We root for her and we hope she only comes to the conclusion we think is the best for her. No matter how charming Gleeson is in his abbreviated time on screen (he doesn't show up until an hour in) there is no reservations about Tony being the right man for Eilis. To that point, Cohen is absolutely terrific. Honestly, I couldn't stand his character in the aforementioned The Place Beyond the Pines and I expected some of that to rub off on the actor portraying him, but the moment Cohen cracks a gleeful smile on a bus ride he shares with Eilis, I was sold. He portrays the genuine, hard-working and humble man so well his spirit is contagious. Combined with Ronan's exceptional showing and a lush supporting cast that also includes Jessica Paré, Emily Bett Rickards, Eve Macklin and Nora-Jane Noone Brooklyn is the quiet, sublime crowd-pleaser of the year.